In essence, this is a continuation of my previous article, “Breaking the Arduino Speed Limit” where I introduced the CA3306 fast analog-to-digital converter (ADC) and a 128x64 LCD screen to display the results. That article created so much interest that I decided to write a second article. Here, I will show the solution to the clock “glitches,” add a serial LCD screen that leaves more Arduino pins available for other things, and introduce an eight-bit fast ADC. Then, we will put it all together to make an even nicer digital storage oscilloscope. FIGURE 1. Glitch from lack of clock synchronization. Before we get started with the ADCs, let’s change out the LCD screen for one with color and a serial interface so it will use less Arduino I/O pins. 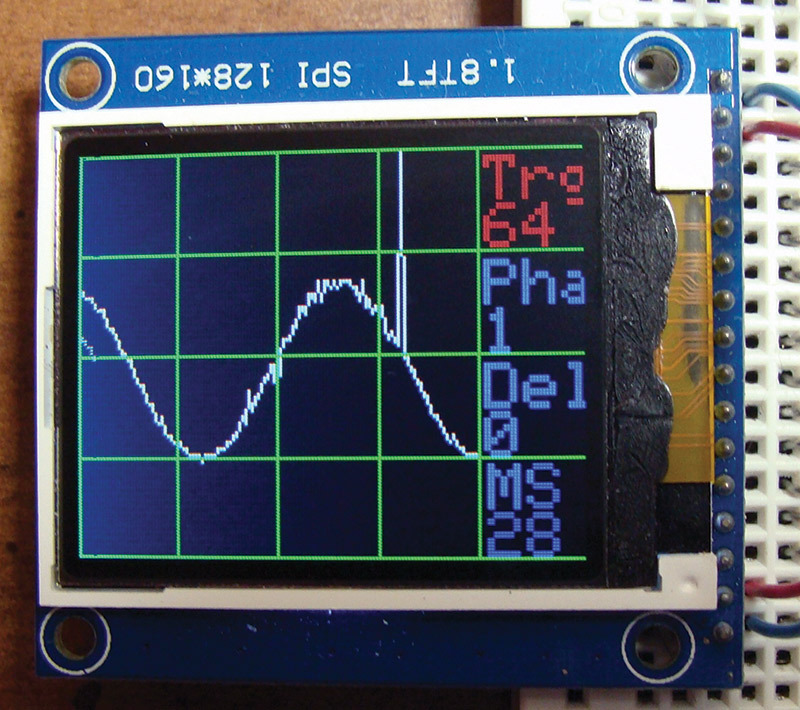 A popular serial LCD is the 1.8TFT SPI 128x160. It only needs five I/O pins with power and ground to operate. There appear to be two versions of the 1.8 inch TFT LCD screen. One version has 10 pins and the other version has 16 pins. The pin definitions are written on the bottom of the circuit board, so it is just a matter of writing them down before you flip it over and wire it up. In Figure 3, you can see that the pins are clearly marked. FIGURE 3. Back side of 1.8 TFT LCD. The programs for this LCD will use the new built-in TFT drivers found in version 1.0.5 of the Arduino driver. The programs will not work without this TFT driver being properly installed. 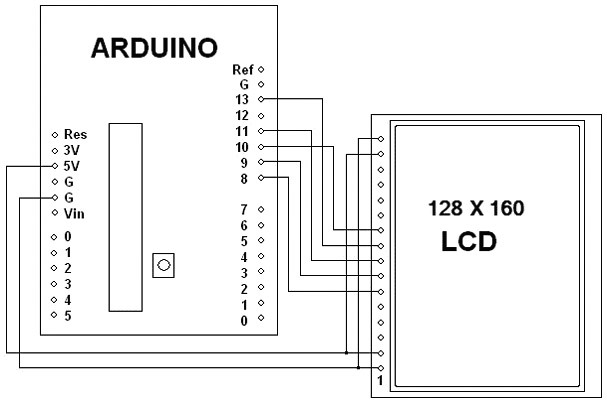 Table 1 is a chart showing how to wire the Arduino Uno to the LCD screen. I ran jumpers to connect the two grounds and 5V pins together on the breadboard. Note that pin 1 of the LCD is on the right and pin 16 is on the left as you look at the top of the LCD screen. Figure 4 is the schematic diagram of how to wire the LCD screen up. 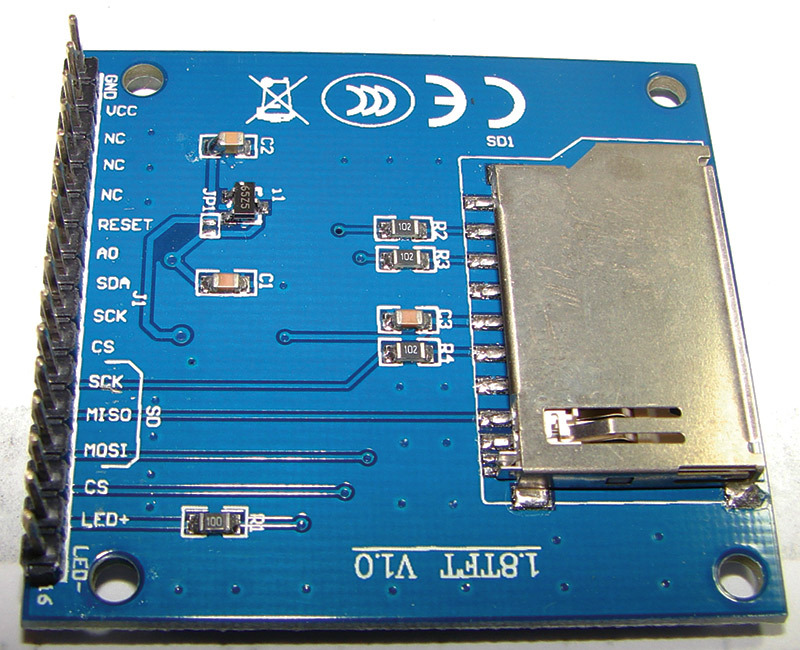 Note that D0-D7 and the six analog pins are now all free to be used for this project. 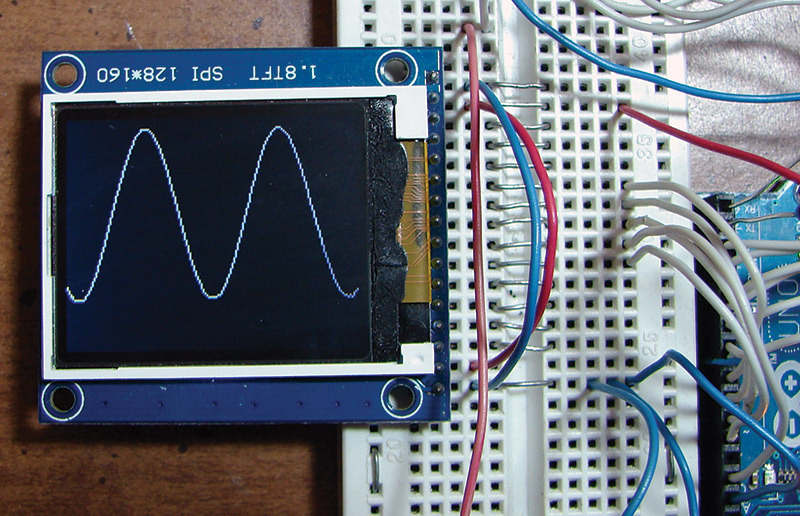 We can start with a simple oscilloscope demonstration program that displays what is on A0 to test out the display. 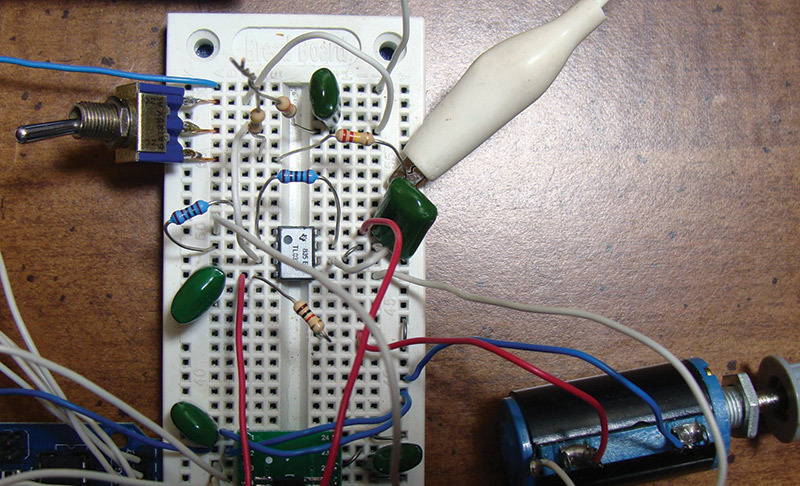 For a very simple analog input circuit, you can use a .1 µF capacitor and a 10K variable resistor to provide bias. 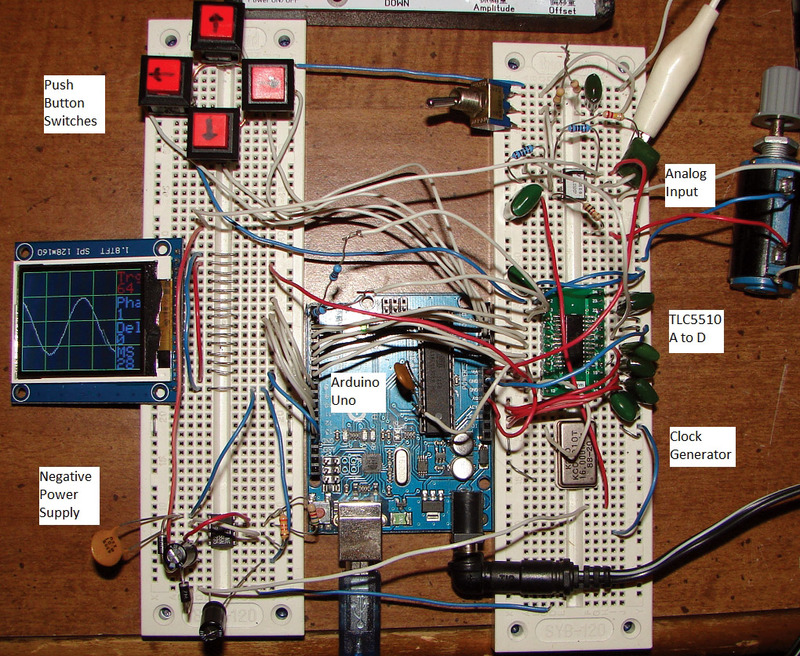 Figure 5 shows a simple Arduino oscilloscope. FIGURE 5. 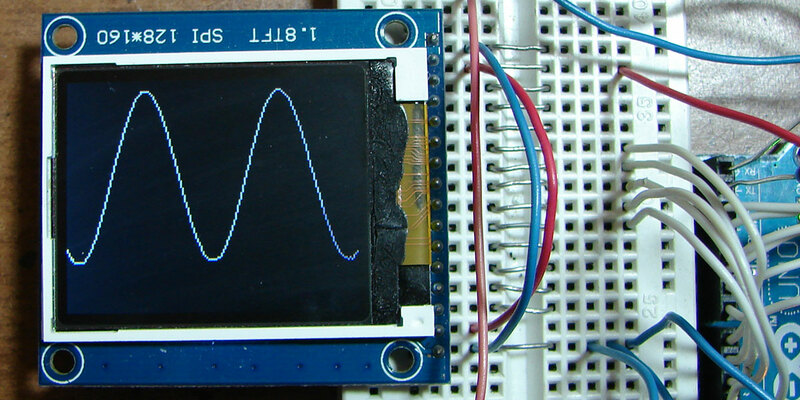 Simple Arduino oscilloscope. The TLC5510 is eight-bit at 20 million samples per second. The TLC5540 is eight-bit at 40 million samples per second. The ADC1175 is eight-bit at 20 million samples per second. The ADC1175-50 is eight-bit at 50 million samples per second. Figure 6 is the TLC5510 schematic diagram. Note that pin 1 is at the bottom, so the IC is being drawn upside down. I wired it up upside down to match the schematic and then spun the breadboard around to hook it up. The capacitors are all .1 µF at 16 volts. Figure 7 shows the TLC5510 wired up and running. In this photo, you can also see the 10 pF capacitor going from the clock to pin 9 of the Arduino Uno. Now to put some of those free analog input pins to work. You can connect four momentary contact switches to A2 to A5 to select up, down, right, and left. Up and down will select the item to change, and right and left will change the values of the selected item. 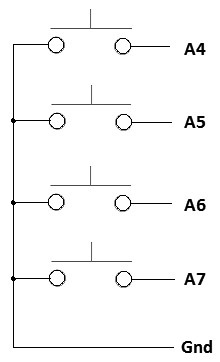 You could put all four switches on one analog pin by having each one select a different voltage. Figure 8 shows the switches schematic. FIGURE 8. Pushbutton switches schematic. The “bias” control provides a bias to the ADC. You will need a bias of about 1.3 volts as 2.6 volts is the maximum input. The 1.3 volts then becomes the “zero” position in the middle of the LCD screen. 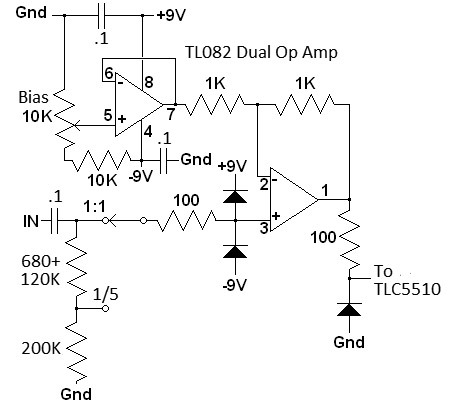 This bias is the 0 signal since the ADC uses 2.6 volts as its maximum input voltage and does not allow any negative input voltages. 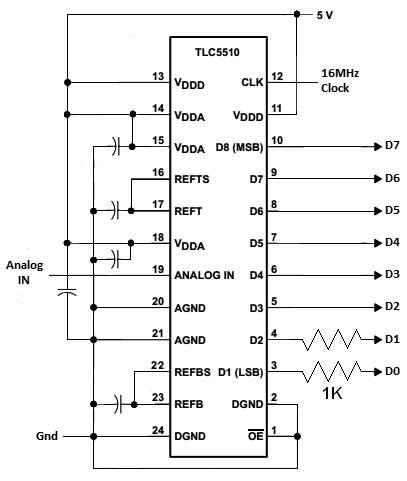 Figure 9 shows the analog input schematic. FIGURE 9. Analog input schematic. For a -9 volt source, you can use a 9V battery or (even better) use a 555 oscillator with two diodes to form a simple power inverter. 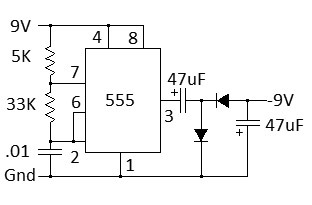 Figure 11 is a schematic for a 555 inverter. The diodes can be a 1N4001 or similar. Under load, the output is only about -5 volts, but that works fine. 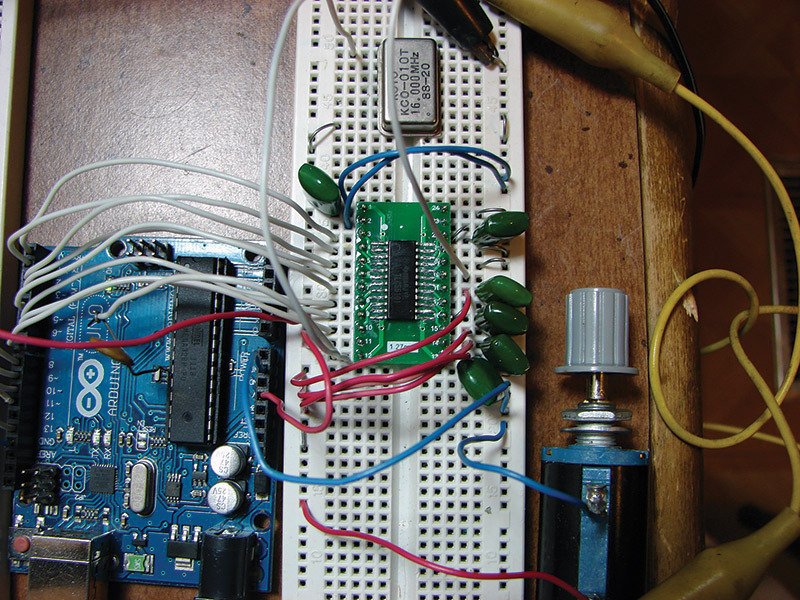 Check out Breaking the Arduino Speed Limit - Part 1.